Floral wreath-wearing city girls, we’re on to you. Unless you spend your days frolicking barefoot in the country, leave the flowers in the ground (or a lovely vase) where they belong. If there’s one thing to be thankful for as summer comes to a close, it’s that women may once and for all stop wearing flowers in their hair as if they were Frida Kahlo. Whether grooving at Coachella, walking up Fifth Avenue, or down the aisle to their betrothed, this ridiculous trend that’s proliferated over the past year needs to wilt and wither away with the falling leaves. Really. It’s time to stop watering—ahem, wearing—those damn accessories. My vehement dislike for the accoutrement stems back to 1982 when I was asked to wear pink roses in my hair to a family wedding. I was four and not at all amused by the request. I don’t recollect much about the whole scenario, and I’m sure I didn’t give much of a reason other than a good old fashioned tantrum, but fast forward 32 years, and my distaste for the trend continues. But now, I have an explanation: it looks dumb because it’s not real. And I don’t mean the daisies and begonias aren’t real. They very well may be. But the crown itself (or headband or cluster of buds) screams disingenuous. You did not pick a few wildflowers from the lawn at Yasgur’s Farm and fashion them into a headpiece while listening to Richie Havens perform “Freedom.” No, you probably hired a florist or, worse, went to Zara or TopShop—one of the many chain shops that now tout faux-flower crowns for upwards of $50—and purchased a headdress, which you then artfully arranged on your well-coiffed head before skipping off for drinks at the Mondrian rooftop. The flower crown is a prime example of trying way too hard to be someone you’re not. Like, say, Cersei Lannister or Sansa Stark. But let’s be honest here: this is not Kings Landing and you are not a character in Game of Thrones. See? She may not be the world’s biggest arbiter of fashion, but plastic equals fake equals unreal equals not cool. What gives? Why now? It’s been 45 years since Woodstock! A product? More like a living organism. On your head. In fact, Wyrick, who takes at least an hour to create one piece, says they only last up to two days—at most. And that probably depends on how long the petals had already been lying on the cutting room floor. Wyrick and her team only craft crowns from “recycled” flowers, aka buds that have detached from their stems in the process of creating other arrangements. To be fair, while I myself did not want to rock one as an actual flower girl, there is something to be said for the ethereal, fairytale look while floating down the aisle to your betrothed. That is, if you’re barefoot and the wedding is held outdoors. Again, authenticity is key. In other words, when it doesn’t attempt to swallow your naturally pretty and freckled face as it did to New York One traffic reporter Jamie Shupak who wore an oversized floral headdress to her wedding last February. 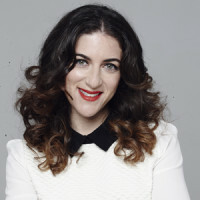 Take stylist and fashion blogger Jenny Greenstein of Your Soul Style. At her Palm Springs wedding to Dina in 2012, she wore a Cymbeline dress that looked more like a Grecian slip. she allowed her toes to mingle with blades of grass rather than squeezing them into Louboutin’s she’d never wear again, and her makeup wasn’t caked on like the icing of the evening’s dessert. In keeping with this laid-back, bohemian look, she capped it off with a ring of coral and pink tea roses with Italian Ruscus around her curly brown hair. The look was subtle, sweet and screamed “au natural”—even though she paid $75 for the topper. Which brings me back to my point: If you’re an earthy darling whose all “free spirit” and “la-di-da” when it comes to life, fine. Let the flower crown represent you, or rather go on and represent the flower crown—preferably on a farm somewhere. And please, please for the love of Zeus (himself a floral crown wearer) use real flowers. In fact, go on and (gasp!) make your own for a special occasion—again, preferably on a farm somewhere. But for the rest of us who take subways and cabs or even the occasional hit of pot while dancing to Arcade Fire in the desert, let’s remember that flowers look most natural in the ground (or, sure, in a Jonathan Adler vase) and you look most like yourself when you’re not trying so hard.